The Minnow Lure by timebeestudio is licensed under the Creative Commons - Attribution license. Fully planned, designed and produced in house, along the lines of some of my favorite minnow. My target was to create a fully functional minnow, I think is the first with this system, and not wait that others take example from this model to see what other great models will be born! The materials used are a string of co-polyester (XT) and a normal PLA Transparent (green). 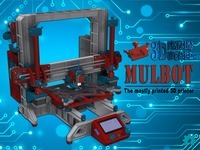 In the video you will find the necessary instructions to create with your printer 3d a minnow fully functional! Say thanks by giving timebeestudio a tip and help them continue to share amazing Things with the Thingiverse community. We're sure timebeestudio would love a Tip, but unfortunately they have not setup their accounts to receive them yet.